Survival Hardware hadn’t seen such a rush of customers since the last Armageddon prediction coincided with Black Friday. Manager Clint Sanders rubbed his hands with glee. Oh, Marley, if only you hadn’t gotten drunk and decided to go zombie hunting. Was it only last Christmas? Yeah. Sense of urgency, plus that “We’re in this together” crap. He got to the counter and nodded at Bitsy, who had rung up a chainsaw and a half-crate of bleach. God bless survivors. Clint continued to the back. Out of habit, he checked the exit door, even though it was always locked from the outside. He needed to delete Marley's old code from it. “That’s impossible!” he declared. The store fell silent. “Boss?” Bitsy’s voice ended in a squeak. He reached under the counter for a shotgun. Bitsy grabbed the chainsaw. They had filled them that morning—another example of the excellent service at Survival Hardware. The door swung open, and the zombiefied remains of his late business partner, Marley, staggered through. Clint to blasted him with the shotgun. The impact knocked the Marley out the door. “Screw that! I’ve been prepping all my life for this!” With a howl of challenge, Bitsy dashed out the door. She swung low and decapitated her former boss before moving on. Thundering footsteps signaled the customers following in her wake. He gaped at the carnage while Dirk called 9-1-1. It’d be too late by the time they got there. All that’d be left was to clean up the zombie parts and get the customers back in to pay. In the 2040s, zombies have become a reality. They rise from the grave, intent on eating brains or sometimes completing something that they didn't finish in life--even if it's a beer and a TV show. And, true to so many phenomenon in life, we are caught unprepared and unaware. That's how I started the world premise, and I let the story take me from there: People want to understand them, defend them, study them, use them--but above all, they want those vermin out of their yard! 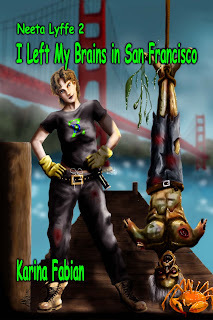 Thus, the hero of the story--Neeta Lyffe, Zombie Exterminator. It's an age-old science fiction writers' trick--use the future to discuss an issue of today. In my case, the zombies are just part of a world gone a little loopier than it is now. You’ll find a great example of government waste and bureaucratic infighting in the Broken Bridge, started as a cooperative effort and halted with 120 feet to finish—and one side 60 feet lower than the other—because neither side communicated with the other. Video blog sites have exclusives on banned videos of a gruesome carnage—but only for members. California has subsidized protesting; and everyone gets an Adult Starter Allowance until they’re 25, as long as they aren’t working, of course. The newest environmental theory is Global Fattening, and the hot new protestors, the undead! All of this makes a delightful mishmash of insanity into which to drop one woman who just wants to protect people by rekilling the undead--and hopefully making a little money and having some kind of social life while she's at it. This week, we will be highlighting a word that is a definite must for anyone wanting to survive and/or thrive after a zombie apocalypse. Determination. Not only that, but we will be highlighting Pembroke Sinclair, an awesome zombie writer with a great set of zombie apocalypse books. Determination is all over Sinclair's stories, Life After the Undead and Death to the Undead , mainly concentrated on a young girl named Krista. After a wave of zombieness takes over the United States, young Krista loses her family, but is determined not to follow in their fate. She escapes to a division, a wall separating the zombies from the more humid Eastern United States, and helps to build it. She is determined to protect as many people as she can, and along the way, she battles with not only the mindless undead, but also the tyrant families that now hold power over the remaining population. In the second book, Krista and Quinn, the survivor she has fallen in love with, are caught between the zombies who want to eat them, the powerful ruling Families that want them captured, and other survivors who want them dead. 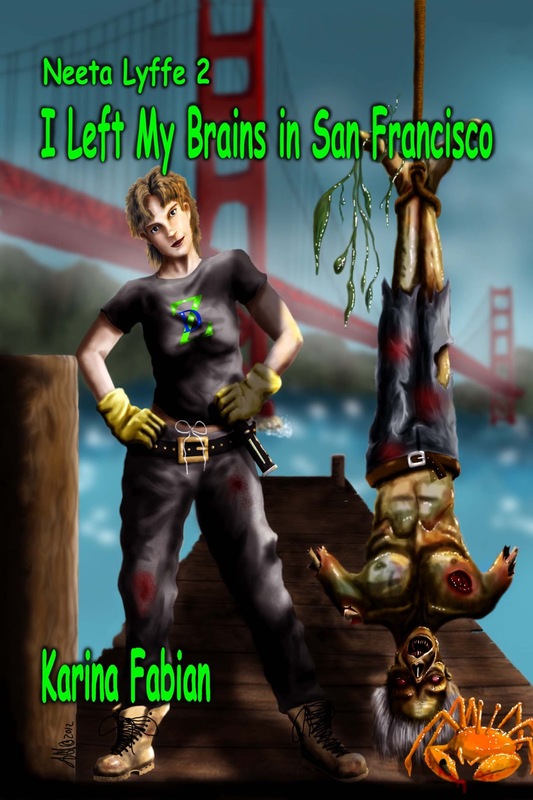 Determined to make it and thrive, Krista and Quinn become perfect examples of zombie apocalypse survivors. From the reviews on Amazon.com: "Life After the Undead is a well-written story that represents a perfect blend of young adult fiction with a horror twist. Sinclair does an excellent job of fully developing both the plot and all of the characters involved in the main action of the novel, and she walks the fine line between too much blood and gore and just enough eloquently and with style. 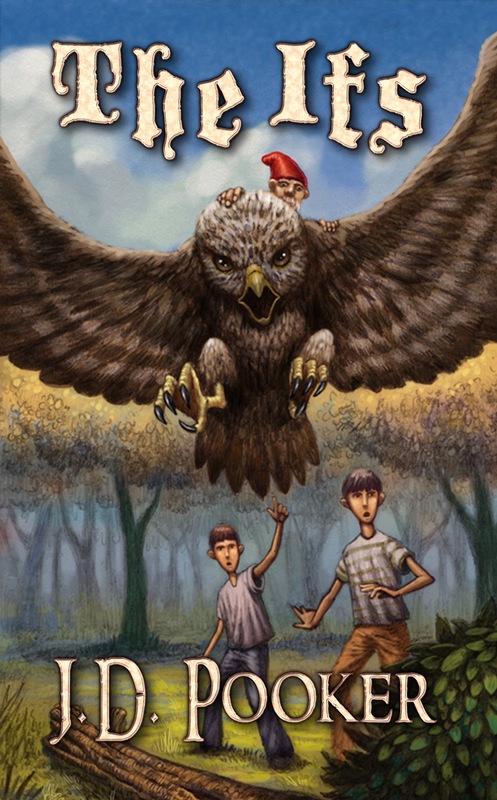 I would recommend this novel to anyone who enjoys a good adventure, regardless of their age. It was fun and exhilirating to get lost in the world of the undead as seen through the eyes of a capable and independent protagonist." Check out Life After the Undead here, and Death to the Undead here. What's better than reading a zombie book or story? Watching a zombie movie. Ok, maybe not always as this genre is filled with a ton of stinkers. But there are some things to take note of. 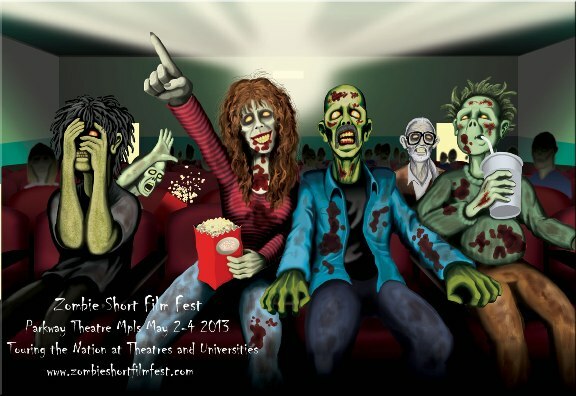 How about a Zombie Film Fest? And... you can submit your short film - they are only 15 minutes long.... The top eight films are supposed to be shown nationwide. See submission details. ** And speaking of Zombie films.... found this link on YouTube - I haven't watched it yet, so feel free to comment or share your thoughts. 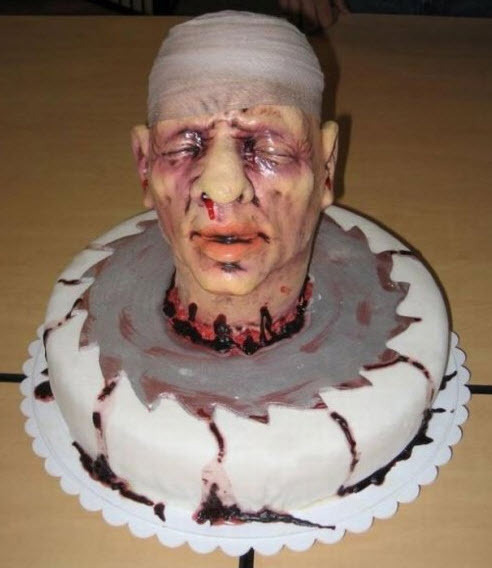 How better to launch a zombie book than with a zombie cake? Was thinking of those brain cupcakes I wrote about earlier. Might be fun if I or someone can figure out how to make them. Be warned! Some of these are really gross! Oh man, I don't think I'd dare serve anything like these.... what do you think? haaa! It may come as a shock to some of you, but there is a world outside zombies--and it can be interesting! I was given permission to talk about part of that "other" world as it pertains to me, so I hope you enjoy! I write in a variety of genres, including fantasy, sci fi, and children's books. I have two pictures books scheduled for release in April, as well as a middle grade book called The Ifs. Recently, I received the cover for my middle grade book, and I have to say, it's freaking awesome! Landon and Broden don’t get along very well. As brothers, they spend most of their day fighting with each other or plotting ways to get revenge. Then, strange things start happening, such as homework being mysteriously finished and clothes being put away in the hamper. The brothers want to share their weird experiences, but they don’t know if they can trust each other. Then, when a tiny, six-inch tall man asks them to help him fight a battle, they’ll have to put their grudges away and learn how to work together. Can they face their fears and figure out what it takes to be brave? The book will be available in April (date forthcoming) from Little Devil Books. I wrote it for my boys. I wanted to give them a story; something tangible they could hang on to, point at, and say, "That's me!" Reading and writing are so important to me, and I wanted to make it fun for them. I don't think they completely appreciate what I've done right now, but they will one day. Or be completely embarrassed by it. Either way, I win! Don't worry, I'm not giving up zombies completely. In fact, after the young adult novel I'm working on, I plan on writing another TWO zombie novels. Good afternoon Neeta. It's so good to finally meet you. It's a pleasure, Amanda. I appreciate this chance to tell folks about zombie extermination. It's a growing specialization--unfortunately, because the demand is still growing--but every one of us hopes to work ourselves out of a job eventually. So, tell me, why did you choose your career path as a zombie exterminator? It's a family business. My mother, God rest her soul, was a single mom working as a general exterminator when she and her partner inadvertently stumbled upon a huge zombie infestation while investigating what a cemetery thought were rats. She and her partner discovered they had a talent for mowing down zombies. (In this case, literally. That riding lawn mower saved more than a few lives that night.) Since there was obviously a need, they specialized. Mom was a real activist for the cause of zombie extermination and prevention as well. I hope she looks at my efforts with the reality TV show, Zombie Death Extreme as another way of building awareness. What makes a good zombie exterminator? What's the best way to kill a zombie? You have to destroy the brain: sever the spine at the neck. Decapitation, smash their brains. Setting them on fire works well if they're I an advanced state of decay, but sometimes, that only stalls them enough to give you a chance to go for the neck. Do you have a favorite weapon? Chainsaw and a supersoaker full of TidyToidy. They're the most effective, IMHO, but the chainsaw does get heavy. I train a lot. How does one secure one's home against the undead? First, attitude. Often an ARM (Animated Rotting Meat) will return to a familiar place--a home, workplace, bar… Some people still think it's a miracle that their loved one is returning from the dead. It's not--it's a tragedy in the making. These are not people anymore. I can't state that enough. A moment's hesitation at seeing Uncle Joe can cost you your life--and maybe bring you back to hurt those you love. Second, cell phone and car keys. Most major cities have a skilled Z-Mat team and exterminators on call. Get in your car and dial 9-1-1 as you speed away. Some zombies are fast, but none can outrun a speeding car. Third, cleaning products. We don't know why, but with few exceptions, cleaning products will repel zombies. Not the enviro-friendly stuff, however. Bleach. Amonia. You know those scrubbing bubbles? Those are actually kind of funny to watch--but don't delay your escape to get some video on your cell phone! Trust me, YouTube is not worth your life! After that, imagination is your best defense. Some zombies can be deflected by cigarettes; others by a beer. Some will stop dead (pardon the pun) to watch Days of Our Lives. In the Middle East, many devout families nonetheless keep a package of bacon in their refrigerators just for zombie defense. Whatever you do, however, try it and run. Is it true that if you blend in with a horde of zombies and pretend to be one, they will leave you alone? No. Oh, please, please, Amanda! If any of your readers believes that tell them no! They may get distracted by a pound of raw hamburger, but they can definitely tell the difference between a fresh brain and an undead one! No problem. I hope folks will take a look at the book Karina Fabian wrote about some of my adventures on the Zombie Death Extreme Set. It's called Neeta Lyffe, Zombie Exterminator. It's a fun way to learn more about zombies and zombie defense. The publicist from my publisher, Intrigue Publishing, spotted this truck when she was out and about in Maryland. 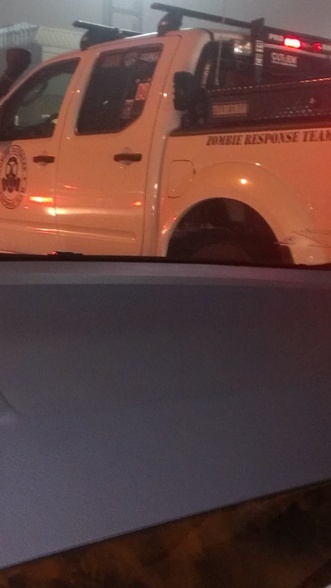 Check out the name on the side: Zombie Response Team. And in case you wondered... yes, they do exist. See link above. Thought my fellow zombie writers and readers would appreciate a great horror market site I've come across recently. Maybe you already know of it, but Horror Tree is a great market list, with plenty of places to send your stories to. An interesting market that I found is the Young Adult Dark Moon Digest special issue. Deadline is April 15 for horror stories, 500-4,000 words with zombies, vampires, etc. Whatever you term as horror. (NOTE: Site says scary stories - more Stephen King than Stephanie Meyer.) Pays $10 plus a copy. Check it out! For more info, see the Dark Moon Digest site. A Quick Zombie Book Update on GIRL Z: My Life as a Teenage Zombie..
* Doing final editing now before the galleys. * The book will be released around JULY 1. Yay! * A cover will be coming very soon. Have seen a preliminary cover. !!!! * Can't believe it is now only months away!! * Want to be part of my blog tour? Please contact me!! I would like to piggyback on the post from Wednesday, as I found the idea incredibly intriguing. In the most basic sense, surviving the zombie apocalypse does mean not becoming a zombie, but there is so much more to it than that. I think that is the essence of what zombie stories are looking at: what does it take to survive? But it's not only surviving, it's living. Anyone with a brain can survive. The survival instinct is one of our most primitive functions. But what does it mean to live? And what does it mean to live when you've lost everything? I think this is one of the basic questions zombie stories strive to answer, along with what it takes to be human. I'm not going to say I have the answer to that question because it will vary from person to person. And it's a question I explore in my own writing. For some, surviving/living might be enough to have their heart beating and most of their family/friends around them. For others, to survive and live they have to face the zombies and wipe them off the face of the earth. We survive/live everyday and face hardships and overcome obstacles. But how would those hardships and obstacles change if the dead rose from the grave and started eating us? How would we cope with losing loved ones closest to us to the undead hoard? How many of us would find the strength to carry on? When it comes down to it, zombies stories aren't about gore and walking corpses (although they are present and fun!). Zombies are nothing more than catalysts that make us face our deepest fears and question what it takes to continue on. They make us question our own humanity. Like Sabrina said, there is way more to survival than trying to avoid becoming a zombie. How many of us would be up to the challenge? But there is a deeper meaning to the word survivor, as well. In C.A. Verstraete's upcoming YA zombie story, GIRL Z: My Life as a Teenage Zombie, sixteen year old Rebecca not only survives becoming a zombie, she has to continue being a teenage girl, which is hard enough to survive on its own. Throw in missing moms, strange and frightening changes, weird diets, and meeting (and crushing on) another part-Z survivor, Gabe, and it's easy to understand how Becca is more than just a regular, run-of-the-mill zombie survivor. For more information on GIRL Z: My Life as a Teenage Zombie, check out this interview with C.A. Verstraete. What would be the hardest thing about trying to survive in a zombie apocalypse? For a twist on Two Sentence Tuesday, I thought I'd share a few interesting little things I've come across. 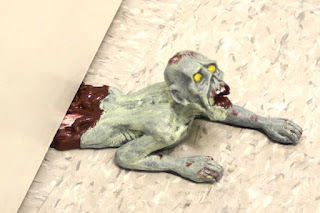 Here's something guaranteed to freak you out every time you get up at night and forget it's there - how long would you use this zombie doorstop? ha! This is kind of cool (haa!) Make brain-shaped ice cubes - Fred & Friends Brain Freeze Ice Cube Tray for your next party! Another zombie book to movie, Warm Bodies - how many brains do you give it? Suddenly there is a spate of upcoming zombie movies, which is exciting for zombie readers and fans like us. The question is, book or film - which is better? I first asked this question here after seeing Abraham Lincoln Vampire Hunter, which I thought was an amazing movie. The book is on my tbr (to be read) list, which is growing longer by the minute. Out now is WARM BODIES: A Novel , another book turned movie, which looks kind of interesting and quirky. I haven't yet read this either. The Amazon book blurb: R is a young man with an existential crisis--he is a zombie. He shuffles through an America destroyed by war, social collapse, and the mindless hunger of his undead comrades, but he craves something more than blood and brains. He can speak just a few grunted syllables, but his inner life is deep, full of wonder and longing. He has no memories, no identity, and no pulse, but he has dreams. ** Have you seen the movie and/or read the book? How do they compare? Like - love - the movie - hate it? Why? The classic definition of a zombie is either a human under the control of a Voodoo Witch Doctor or a corpse that has been animated by _______ (fill in the blank) and is now wandering the earth looking for human flesh to feed on. Sabrina has a great blog about the definition here. But I've been thinking a lot about the term "animated corpse" and wondering if it can apply to other aspects. Take, for example, Frankenstein's monster. He was nothing more than bits and pieces of various corpses sewn together and reanimated. In essence, a corpse that was brought back to life. If you ask me, I would say he could pass as a zombie. But wait, you say, the monster had free thought. He could learn and rationalize. Traditional zombies don't have that capability. To that I would reply: You are correct. However, zombies retain some level of consciousness, even if they don't remember their human lives. Take, for example, Day of the Dead. In this film, the good doctor of the underground bunker is conducting experiments on zombies to see if they can be "trained" and how much of their humanity they retain. His methods are questionable and incredibly unorthodox, but he proves that a zombie can remember. He teaches Bub simple tasks, such as talking on the phone and how to enjoy music. At the end, after the doctor has been murdered, Bub even remembers how to use a gun to exact revenge. In Land of the Dead, many of the zombies continue in undeath do what they did in life. They replay their jobs over and over again until something changes, and then they start to think. No longer are they mindless husks wandering the world hoping for prey to cross their path, they become hunters. Evolution finds a way to take over. So, would it be possible for a dead person to be brought back and have their memories and ability to function intact? What about near-death experiences? Those people have died and come back to life and they seem to function like normal humans. However, if you are talking about someone who has been dead for an extended amount of time, at the most basic level, I would have to say no, it's not possible for the person to be able to come back and function. That's the point of the vast majority of zombie novels. It shows us the horror of tampering with things we shouldn't tamper with. But what if they could be brought back to life, altered and improved. 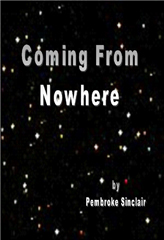 I explore this unconventional side of reanimating the dead in my first book, Coming from Nowhere. Smart zombies, if you will. But it's not considered horror, it's classified as science fiction. Maybe that's the difference between the conventional and unconventional definition of a zombie--horror versus science fiction. What do you think? Can their be a broader definition of "zombie"? 10. They're the next big trend! Forget your sparkly vampires--maggoty zombies are the hot literary trope in the fantasy horror world! …okay, this is really a lame reason to write about them. Write what you enjoy and what's in your heart--make the trend; don't follow it. However, this is the first time I actually was part of the current, and it's a new experience for me. 9. Need to incorporate all five senses? Zombie stench makes that easy! 8. There's so much uncharted territory. Let's face it--if you have to add glitter to your vampires to make them new, the genre's been done. Zombies are still wide open. Really--see the guts? 6. You can abuse them freely. They're dead. You can whack off their heads without remorse. Or, if you choose to go for the legs and leave them crawling and groaning "flesh wound!" it's funny. Bonus--the ASPCA doesn't care about them! 4. Easy to write dialogue for. 3. What a literary device. In Neeta Lyffe, Zombie Exterminator, I use zombies as a foil to attack some of the finer aspects of society--conspiracy theorist, radical ecologists, activists, etc. It was a lot of fun to point at these groups with a rotting finger. 2. When you've explored all aspects of life, what's left? Oh, wait! 1. To prove you have the braaaiiiins for it! We are going to veer off of the normal lexicon of zombie enthusiasts to pay attention to a word that usually is not associated with the living dead. Who will survive if the zombie apocalypse happens? While we all would hope that everyone we love would make it, there are no guarantees. Right now, there are a certain group of people that you consider your family. That could be your mom, dad, and siblings, or you could be the mom or dad, and consider your kids your family. You could even consider your closest friends your family, or maybe even an extended family like grandparents or aunts and uncles and cousins. Sadly, if some horrible, highly contagious epidemic were to sweep across the world, there are no promises as to who would be left standing. In many cases (all fiction so far, of course) families are wiped out, leaving orphans and loners who have to survive alone. But in my book, The Loki Variation, after the zombie apocalypse, the smart people; the survivors, end up forming families of their own. Sasha is a hard-headed, independent young woman, just striking out on her own, when she is confronted with the choice of saving a little girl, Nora, from a fate legitimately worse than death, or pretending she doesn't understand the gravity of the situation. Derek is an introverted guy who just wanted to visit his favorite aunt, and get away from his boring office job for a week on vacation in Florida when he is thrown together with other survivors of the end of the world. Then there is Hud; a military man who doesn't joke around when it comes to survival, who teeters between trustworthy and shady, who ends up making a sacrifice none of the others will ever forget. Along the way, Lily, Adam, Travis, and Ripley all make an appearance, and lend their own skills and personality to a realistic, horrifying, and hopeful story of survival, change, and family - a family forged of loss, desperation, and love; the emotion that humans will never lose, even in the face of extinction. There's no bond stronger than family - even if that family is what you find after the end of the world. Find out what happens when a group of survivors come together to form a bond this strong against the forces that work against them. 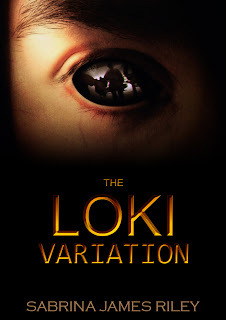 Check out my book, The Loki Variation, to find out just how important the word family can be at the end of the world. "Watch out George Romero The Loki Variation is a top notch book that I could see becoming the ultimate zombie movie! The action started immediately and kept me on the edge of my seat until the last page! Sabrina James Riley's descriptions were so vivid that I could visualize every scene with such clarity. This book needs to be put on the big screen!" "The zombie genre has been around long enough that there really isn't anything that hasn't been done. However this author took the old and put a new spin on it. I couldn't put it down." "This is not your average zombie book, folks. These critters are mobile, agile and hostile and make for a much more credible threat than just about any other I have read. Reading along about the devastation caused by these predators makes you wonder how anyone could survive. The closest I can come to compare is with the night runners from Jim O'Brien's New World series, but the monsters of this book are clearly this author's own creation." "I loved this book! It is truly a page turner, from the first moment it was hard to put down, until I got near the end of the story and I didn't want the book to finish. I immediately cared about the characters and couldn't wait to see what would happen to them next. The scientific side of it made it sound just real enough to scare you. I've suggested this book to everyone I know, and would really enjoy seeing the story on the big screen. I eagerly await more from this author!" If the world ended, who would you consider family? Do you think you could make it with people you've never met before, because of the trust and love you found in them? Guess I'm on a brainnnnssss kick. ha! Must be because I've been getting over all this cold-flu whatever clogging up my own brain. So before you run off and check out the graphic (and please do come back and share your comments, or comment before you go!) thought I'd share a few random thoughts on what makes a zombie, well, a zombie. Theories abound, of course, on what the contagion is that can cause this gross, unnatural form of reanimation. Is it a viral or bacterial mutation? An alien life form? While many do go the bacterial-viral route as I did in GIRL Z: My Life as a Teenage Zombie, I gave the virus a mutation. Those who are young, strong or caught in the earliest stages of infection can be treated and will only turn into part-zombies. They have special dietary needs and odd physical traits, things that can seem worse than death to a teenage girl. But to her credit, Becca survives and learns to adjust, her love of family and the goal of protecting her cousin providing strong motivation. Obviously, "real" zombies have no motivation except hunger as explained in this very interesting graphic over on BuzzFeed showing the Anatomy of a Zombie's Brain. Take a peek and share your thoughts.